We Need Your Support for 2016-2017! * PREDATOR SONGSTRESS ON THE ROAD New York Dates to be announced soon! * DAE vs CZECH ROCK LEGENDS vs ORCHESTRA DAE in Prague & Seattle! * DAE ON THE GETTYSBURG BATTLEFIELD A massive project for the GB National Monument! 2016 was a tremendous year for Degenerate Art Ensemble. After nearly three years of work, we premiered Predator Songstress in San Francisco at the Yerba Buena Center for the Arts and in Seattle at On The Boards to sold out crowds and rave reviews. The audiences who came out to experience the work were generous, smart, engaging and left us feeling deeply inspired to continue what we do. Our collaboration with participants from Path With Art (a brilliant organization supporting people recovering from homelessness, addiction and trauma) in Seattle and the Central City SRO Collaborative ( a fierce organization that trains the former homeless to fight for tenants rights ) in San Francisco affected us deeply and confirmed our belief that art can be a valuable source of inspiration, healing and growth. Predator Songstress has just been booked in New York for 2017! The Czech Rock legends Uz Jsme Doma (UJD) are celebrating their 30th year of making powerful art rock, and reached out to commission DAE’s Joshua Kohl to compose a 90 minute orchestral work inspired by their massive catalogue. Kohl will conduct his score with the South Bohemian Symphony Orchestra in Prague and České Budejovice along with the UJD quartet. The concert will also include orchestral DAE songs sung by Haruko Crow Nishimura. In April, we were sent to Gettysburg, PA by the National Arts Parks Foundation to meet with the heads of the Gettysburg National Monument to discuss the making of a large scale performance work inspired by the site. We were stunned by the place and are overflowing with inspiration and ideas. In August we will spend more time at the park with some of our key collaborators and begin to dream up what it would mean for Degenerate Art Ensemble to make work there on the battlefield. We envision bus loads of people coming from around the country for an overnight performance experience. Help make DAE's backbone strong while we lean into these projects. We urgently need support for studio rental, scenic storage, administrative support and materials, artist fees, technician fees and ongoing equipment maintenance, scenic materials and video production Costs. Your support will make this all happen! Your donation now will help us connect and catalyze the moving parts of these exciting chances to connect with audiences all over the US and the world. This includes Predator Songstress on tour, our collaboration with Uz Jsme Doma in Prague, Seattle and San Francisco and the development of our new site inspired work for the Gettysburg National Monument. Or contact degeneratejoshua@gmail.com with any questions. We were thrilled to perform Predator Songstress at the Yerba Buena Center for the Arts in San Francisco with a SOLD OUT send off on the final night of the show. What an incredible organization YBCA is and what a fantastic audience who took the journey with us. Read about the run in the San Francisco Chronicle HERE. On July 24th we did a presentation about the our newest work Predator Songstress at the Creative Capital retreat at EMPAC in Troy, NY. The presentation was made to a crowd of 300 arts presenters and our fellow Creative Capital artist recipients. We were filled with awe and inspiration at all of the other artist presentations. Tears were shed. On March 2nd 2015, 2,100 fans packed the Paramount Theatre for Degenerate Art Ensemble's remounted and expanded score to Fritz Lang's Metropolis. We send out a huge thank you to Seattle Theatre Group for having us and to the amazing orchestra of musicians who took on the huge 2 1/2 hour epic run with gusto! DAE's Haruko Crow Nishimura and Joshua Kohl will be part of a panel discussion at Seattle's Project Room. What does it take for a two-person partnership to succeed? In response to this question, TPR presents a collaboration workshop by author Joshua Wolf Shenk. Joshua will present the ideas in his new book POWERS OF TWO and engage participants in thinking about and identifying the beneficial partnerships in their lives using the research he conducted for the book. This is aimed at the general public, with an emphasis on those who work in pairs and would like to learn more about Joshua's research and its impact on creativity and success. New Music USA Award Announced for Predator Songstress! "Today is an exciting day for New Music USA; we are thrilled to award $311,000 to the 57 projects comprising our second round of project grants awardees. Our organization and the 43 peer panelists who helped us make our awards are delighted to support an amazing group of projects. We received 1,174 project requests this round! The total amount requested represented the need for more than 9.8 million dollars in support. Those numbers in relation to our current funding capacity are humbling, but also inspiring; these submissions only capture a glimpse of the overwhelming creativity resonating throughout the United States today. We wish we could support even more." We are totally psyched to head up the featured projects page on their website!!! On May 18th at the Moore Theatre in Seattle, we invited 120 people to our open rehearsal for a chance to experience and interact with our newest work Predator Songstress: Dictator. The work is in its early stages, and this event gave us a chance to try out a bunch of new ideas and scale up some things we have only tried with small numbers of people in past experiments. Degenerate Art Ensemble awarded prestigious 2014 MAP Fund Award!!! New York, NY - April 28, 2014 Funding for 39 projects undertaken by many of America's most vital artists working in the fields of contemporary performance was announced today by the MAP Fund, a program of Creative Capital primarily supported by the Doris Duke Charitable Foundation, with additional support by the Andrew W. Mellon Foundation. The MAP Fund, among the longest-standing nongovernment grants programs in the nation, has supported new works in performance that challenge the conventions of contemporary performance, particularly those that address issues of cultural difference in race, ethnicity, sexuality, gender, generation or any other aspect of diversity since 1989. This year, the Fund received over 900 requests for support, which were reviewed in three stages by a total of 51 artists and arts professionals from around the country. Panelists at the final stage of selection were Jenny Bilfield (President and CEO of Washington Performing Arts Society, Washington DC), Yolanda Cesta Cursach (Associate Director of Performance Programs at Museum of Contemporary Arts Chicago), Deborah Cullinan (Executive Director of Yerba Buena Center for the Arts, San Francisco), Darrell Jones (Performer, Choreographer, Associate Professor at Columbia College Chicago), Travis Just (Composer/Musician & Co-Founder of Object Collection, NYC), Gavin Kroeber (Producer, NYC), Carla Peterson (Director of the Maggie Allesee National Center for Choreography, Tallahassee), Tanya Selvaratnam (Writer, Actor, Producer, Activist, NYC), Andrew Simonet (Artists U Founder and Director, Philadelphia), Somi (Singer/Songwriter & Founder of New Africa Live, NYC), Michèle Steinwald (Independent Dance Curator and Producer, Minneapolis), Shay Wafer (Executive Director of 651 Arts, Brooklyn). Grantee projects will receive grants in the range of $20,000 to $40,000, plus additional funds of up to $5,000 for general operating support. Individual artists associated with these projects are also invited to take part in Creative Capital's signature Professional Development Program. Over half of the artists involved with these projects are first-time MAP Fund grantees. Projects will take place in San Francisco, Houston, Providence, Seattle, Chicago, Portland, Tucson, Los Angeles, and New York City, with many touring nationally and internationally and varying widely in scope. In the Clarice Smith Performing Arts Center's At War With Ourselves, the Kronos Quartet will join jazz luminary Terence Blanchard, poet Nikky Finney and a 500-member choir on the steps of the Lincoln Memorial to commemorate the dual anniversaries of the Civil War and the Civil Rights Movement. And on a more intimate but no less urgent front, singer, composer, and performing artist Holcombe Waller will create The LGBT Requiem Mass, honoring LGBT people persecuted in the name of religion worldwide. As a group, the projects represent myriad interpretations of the MAP Fund's core objective - to foster diversity and aesthetic daring in performance today. "In a time when there is anxiety about the health of the performing arts, the MAP Fund is an eloquent testimonial to the massive creative and artistic energy in performance today," said Ben Cameron, Program Director for the Arts at the Doris Duke Charitable Foundation. "We are honored to support these exemplary projects and look forward to seeing these works brought to fruition." Grantee Holcombe Waller adds: "As one of the only major grants available to artists creating new performance work in the US, MAP is fundamentally shaping the ongoing life of the performing arts. Without this grant, my supported project would be hard-pressed to find comparable initial funding to get off the ground. The MAP Fund continues to be a beacon of light for the new work and new ideas born everyday, funded or otherwise." 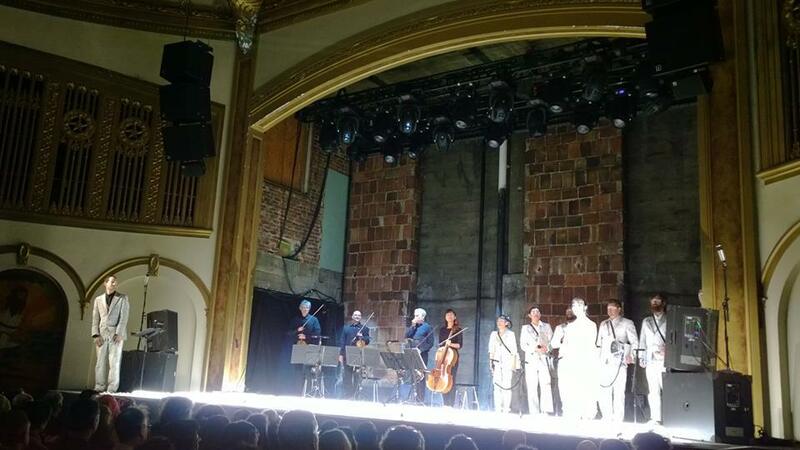 Degenerate Art Ensemble's show with the Kronos Quartet was completely sold out, with droves turned away at the Neptune Theater on November 16th in Seattle. The concert was the 40th anniversary of the legendary Kronos Quartet and featured a 20 minute dance and music collaboration with Degenerate Art Ensemble as the show's finale. Artist Trust just announced their finalists for the Artist Trust Innovator's Award and Degenerate Art Ensemble's Haruko Nishimura is one of the final 8. Full results will be announced in mid October! "2013–14 season. Joshua Kohl, composer and co-artistic director of Seattle’s renowned Degenerate Art Ensemble, premieres new compositions commissioned by the Frye Art Museum. Earlier this year, Kohl visited his father, legendary writer and educator Herbert R. Kohl. The results of this visit are new compositions, some incorporating elements of his father’s poetry and writings, which will premiere as a live performance on September 19 and remain as a sound installation September 21–October 20." Kohl and Nishimura Selected for the "Center for Innovation"
Degenerate Art Ensemble's Joshua Kohl and Haruko Nishimura were selected to be featured in the Museum of History and Industry's new Center for Innovation along with 12 "Northwest Innovators" including glass artist Dale Chihuley, Starbucks founder Howard Schultz, Amazon founder Jeff Bezos and others. The center will have it's grand opening on October 12th 2013. Degenerate Art Ensemble to collaborate with Kronos Quartet! Just announced, Degenerate Art Ensemble collaborate with Kronos Quartet in a performance set for November 16th at the Neptune Theatre in Seattle. DAE and Kronos will be performing a new iteration of "Warrior" - part of the DAE's Predator's Songstress. The performance is part of Kronos' 40th anniversary touring activities. Us DAEers are so thrilled to be working with our long time heroes we can barely stand it! TOP TEN FINALISTS for the Arte Laguna Prize in Venice Italy! "With nearly 8,000 submitted works from over 105 countries around the world, this leading international initiative confirms its role as favoured observatory on the art world."